The sciatic nerve is the longest nerve in your body. It runs from your hip and buttocks area down both of your legs. If you experience sharp pain in your lower back, buttocks, the back of the thighs or the back of the legs you may be experiencing sciatic nerve pain. This pain may go away on its own depending on the cause but it can be very uncomfortable. Vitamin B12 is essential for the health of your nerves. Sciatic nerve pain can indicate a diet deficient in B12. Vitamin B12 plays a significant role in the generation of the myelin sheath that encloses your nerves. The myelin sheath acts like the covering of electrical wires and helps increase the speed of impulses along your nerve cells. Vitamin B12 also promotes the regeneration and growth of nerve cells. Neuropathy, such as sciatic nerve pain, numbness or tingling, in some cases has been found to be caused and made worse by deficiencies of vitamin B12 in the body. Vitamin B12 is found primarily in meat, poultry, fish and eggs. Sciatic nerve pain is sometimes accompanied by a burning sensation, numbness or tingling. Walking or bending from the waist will aggravate the pain. 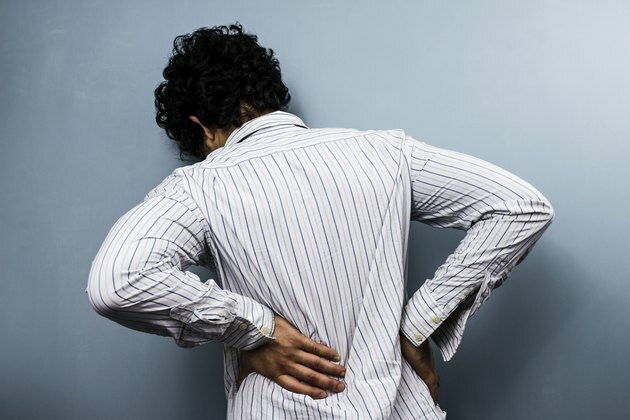 While some people experience severe and debilitating pain, others suffer from infrequent and irritating bouts of pain. Sciatic nerve pain is a symptom, indicating another problem involving the nerve. Although sciatic nerve pain can be related to a B12 deficiency, it can have other causes such as a herniated disk. Seek medical attention if you experience progressive weakness in the leg or bladder or bowel incontinence, according to the Mayo Clinic. To find out the exact cause of your pain your doctor will ask you about your medical history, perform a thorough physical exam and run a series of tests. You can expect some basic muscle tests that assess your muscle strength and reflexes. If you pain lasts longer than four weeks your doctor may order X-rays, an MRI and/or CT scan to help identify the cause. If the cause is a vitamin B12 deficiency, taking vitamin B12 supplements has proven to help reduce the intensity of sciatica and reduce a person’s dependence on strong pain medication, according to "The Sciatica Center." In addition to increasing dietary vitamin B12 there are other self-care measures you can use to relieve sciatic nerve pain. Applying ice for 20 minutes every two hours can alleviate acute bouts of pain. Massaging the area gently will help increase blood flow and release endorphins that act as natural pain killers. In addition, regular exercise also helps to release endorphins. Choosing a low-impact exercise such as a stationary bike will help relieve symptoms without worsening your condition.